PORTLAND, OR, June 10, 2011  When the Shu-Te High School Marching Band members don their colorful costumes for Saturday's Portland Rose Festival Grand Floral Parade, it will be the 20th consecutive year the band from Portland's sister city in Kaohsiung, Taiwan has brought its unique brand of pageantry to the event. The trips began in 1992 as a simple gesture of friendship between sister cities. But today the trips continue because of the significant impact the experience has on the student participants. School Principal Tsai-Yun Hong says the trips provide value that cannot be learned in the classroom. "We can see that students have grown when they get back to Taiwan," Hong said, speaking through a translator. "The experiences they have here  proudly representing their school in the parade and learning American culture while staying with host families  has immense value." Students generally have the chance to make the trip one time, with about 70 members selected each year from the 200 students enrolled in the school's band and dance programs. Students must be in good standing academically and they must pay about 20% of the cost for their trip. The balance of the cost is covered by the Kaohsiung city government and the Shu-Te school. "The tradition of traveling to the U.S. is so popular that it has become a draw for young students to enroll in the music program at Shu-Te," Hong said. The band is also popular with the crowd along the Grand Floral Parade route. The band's costumes, music and presentation are always unique, making the band stand out in the annual lineup of about 20 marching bands. 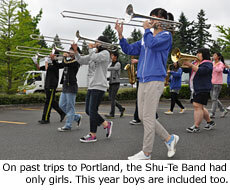 "We try to do something different every year," band director Michael Chen said during rehearsal in a Portland school parking lot. "The crowd is always very excited and curious to see us." This year the band will play a traditional Taiwanese folk song and feature two ornately costumed characters who will interact with the audience. A new twist the crowd may notice is that the band now includes boys. For the past 19 years the band traveling to Portland comprised only girls. "The band gets a lot of encouragement from the crowd," Hong said. "When the students arrive at the end, many of them cry  not because they are tired, but because they are so satisified with their performance on an international stage." As the band rehearsed, pride among Shu-Te members was evident especially when onlookers paused to observe the band. Trumpet player Chia-Jung Yang said, "We want to do our best. We are representing our school and our country." 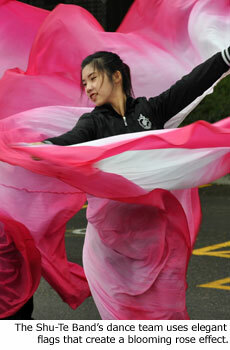 Dancer Hui-Chun Lee added with a smile, "I'll be a little nervous because I know my host family will be looking for me." The international cultural exchange is perhaps what pleases Principal Hong most about the annual trip, as evidenced by the friendships that have developed over the years. Several band staff members have made the trip to Portland all 20 years. Some of the graduates who marched have come back as instructors. Most of the local host families have been hosting for more than 10 years. "The local families treat the band students very well, like their own children," Hong said. "It's a very good cultural exchange. The students gain confidence, and they come back with a new global vision."